Inexpensive to Moderate, depending on the time of year. 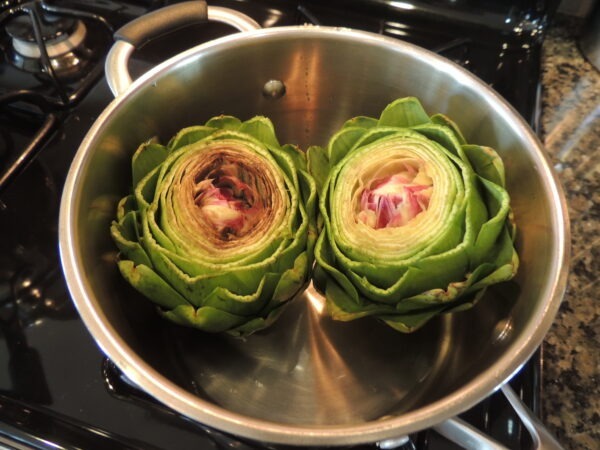 Use this simple technique to steam fresh artichokes in the springtime when they're in season. Serve with melted butter, French Vinaigrette, mayonnaise or aioli. They're worth the trouble! Trim and prep artichokes. 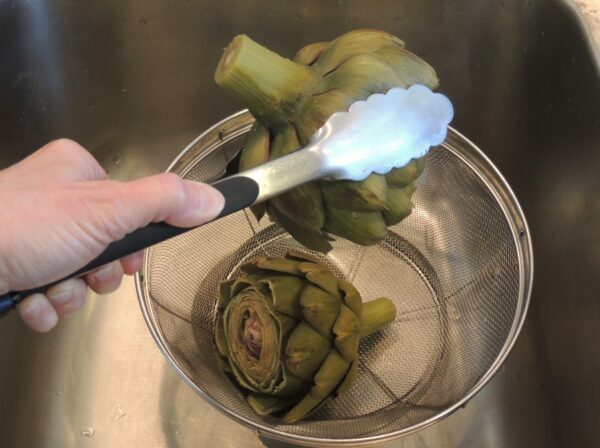 See How to Trim an Artichoke. Place trimmed artichokes top down (stem up) in a steamer insert. Or, place them on their side in a large saucepan with about 1/2 inch of water. *See Chef’s Tip. 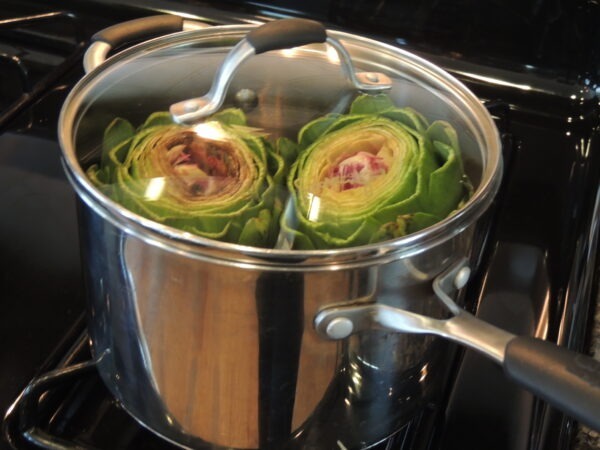 Remove the artichoke and drain in a colander or on a paper towel. Slice off the stem so the artichokes can sit upright on a plate. Be sure to eat the stem! Serve warm, at room temperature, or chill and serve later. Serve with French Vinaigrette (see our recipe) or melted butter. 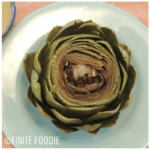 See How to Eat an Artichoke. 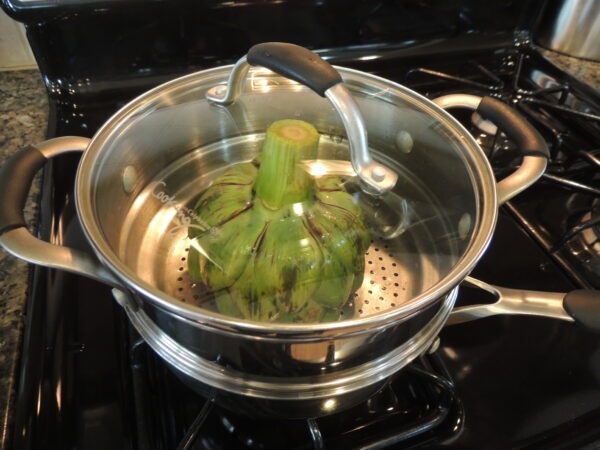 *Chef’s Tip: You can cut off the stem before cooking so the artichokes will stand upright in the pot, but we like to eat the cooked stem, so we leave it on, removing it right before serving. 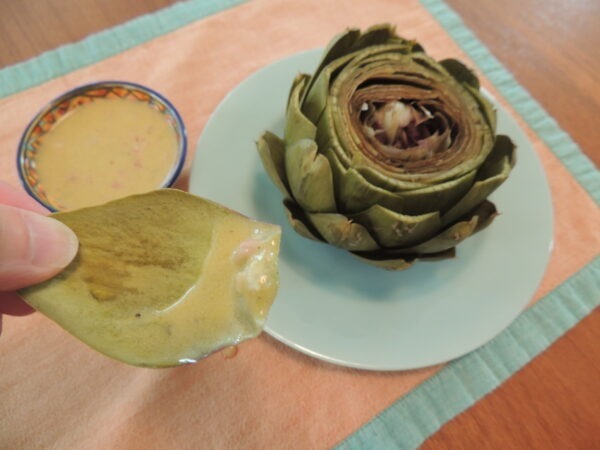 Grilled artichokes - Remove the artichokes when just becoming crisp-tender, about 15 minutes. Slice in half, top to bottom. Brush the cut side with oil and season with salt and pepper, lay the cut side down on the grill and cook another 10-15 minutes. Alternatively, slice in half before steaming.